• A physical entity such as a manufacturing facility, warehouse, or distribution centre. • A logical entity such as an item master organization, which you use to define items. · An inventory organization may have the following attributes: An inventory organization can have its own location, ledger, costing method, workday calendar, and items. · An inventory organization can share one or more of these characteristics with other organizations. An inventory organization, where you store and transact items can have one or more subinventories. Subinventories are unique physical or logical separations of material inventory, such as raw material inventory, finished goods inventory, or defective goods inventory. 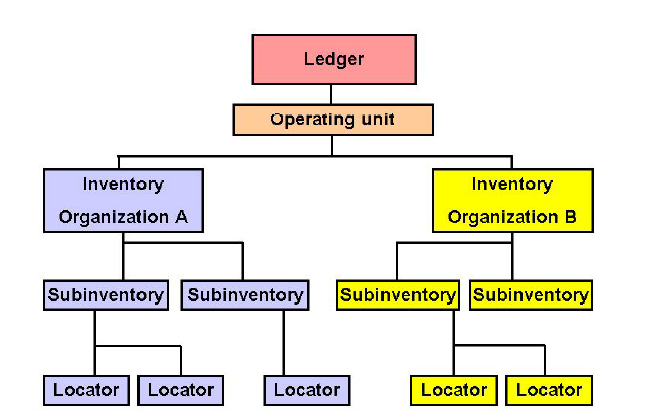 In Oracle Inventory, all material within an organization is held in a subinventory. You must define at least one subinventory for every organization. You can track item quantities by subinventory as well as restrict items to specific subinventories. The subinventories in an inventory organization may be made up of one or more locators. You use locators to identify physical areas where you store inventory items. You can track items by locator and restrict items to a specific locator. Locator control is optional in Oracle Inventory. keep data secure and separate from each business unit. • You can use a single installation of any Oracle Applications product to support any number of business units, even if those business units use a different ledger. • Secure access to data so users can access only relevant information. • You can define a organizational model that best suits your business requirements. • In Oracle Inventory, you can fulfil any sales order or purchase order regardless of them being booked from any Inventory organization. You can also determine if any intercompany invoicing needs to occur based on if the Sales Order or Purchase Order was booked in a different Operating Unit other than the one to which the Inventory organization is assigned. • Define information describing the physical locations of employees and organizations. • Locations are shared between Oracle Inventory, Oracle Purchasing, and Oracle Human Resource Management Systems. Locations flagged as global locations are available to all business groups. You can associate each organization with only one location; however, you can associate more than one organization with the same location. • Physical locations are defined in Oracle Human Resource Management Systems. • Choose an organization classification to describe the general purpose of your organization. • Examples of organization classifications are inventory organization, legal company, and HR organization. 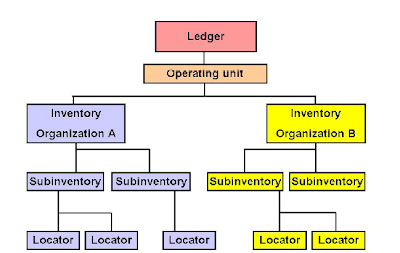 Tie each inventory organization to an operating unit. Each operating unit is associated to a legal entity and a primary ledger. You must enter organization information such as the organization code, and the item master organization. The system defaults this field to the current organization. You must change this for any organization that is not an item master organization. The item master organization should be the first inventory organization you create. Note: The Manufacturing Partner Organization functionality is only available in Japan, Taiwan and Korea. You can enable specific products on the Inventory Parameters tab. These include Oracle Warehouse Management, Oracle Process Execution, and Oracle Enterprise Asset Management. If you have Oracle Warehouse Management installed, then you can enable the Warehouse Control System. LIFO costing: Costing method where it is assumed that items that were received most recently are transacted first. FIFO costing: Costing method where it is assumed that items that were received earliest are transacted first. You determine the starting revision for all items in the organization when you define your inventory organization. You can also choose to set lot control and serial control parameters at the organization level. Revision control is discussed in the Defining and Maintaining Items module. Lot control and serial control is discussed in the Lot and Serial Control module. If you have Oracle Warehouse Management installed, and you are working with a Warehouse Management enabled organization, you can define License Plate Number (LPN) Generating Options. LPNs must be unique across organizations. Setting the parameters on the Revision, Lot, Serial, and LPN tab enables the system to generate LPNs on demand, or through a concurrent request. As long as the number is unique, Oracle Warehouse Management also enables you to generate your own LPNs. This enables to determine the parameters the organization uses when it transfer the material between organization. This enables to setup receiving information, profit and loss account information, and other additional account details. This is specifically needed for the organization which implemented Oracle Warehouse Management System.